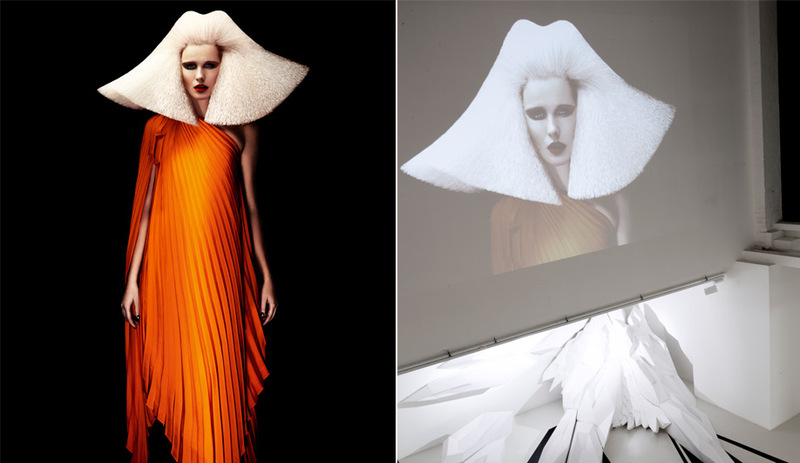 Zaha Hadid Architects designs a pop-up salon in London for the wildly popular Fudge Hair Salon. Two salon chairs take centre stage. 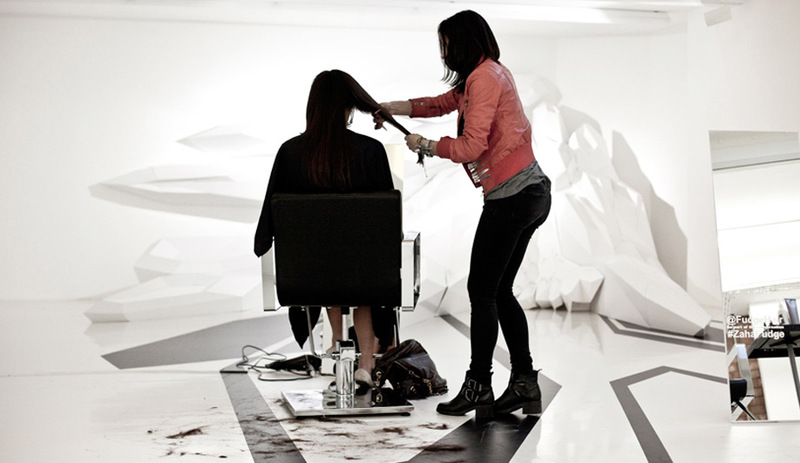 Both clients and stylists are part of the salon-in-a-gallery installation. Stylists coiff their clients while visitors wander in and out of the space. Fudge has gained a cult-like following for its extreme coiffing, which makes it a perfect match for a Zaha Hadid environment. 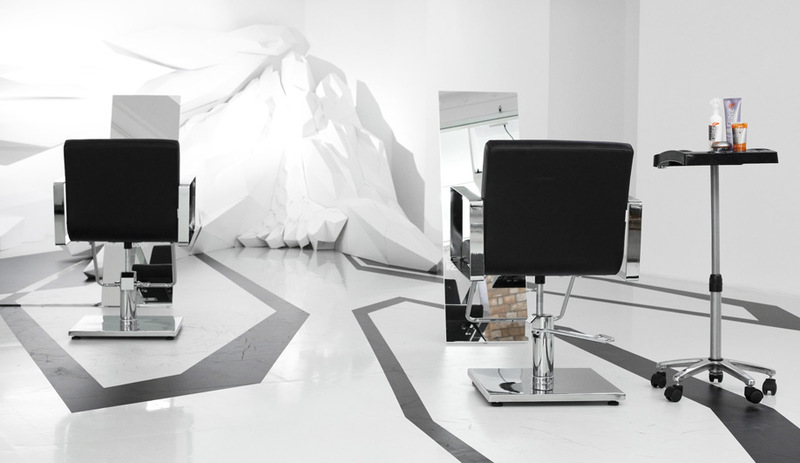 Linear black graphics contrast white iceberg-like forms that jut into the salon space from one corner. London’s cult hair brand has teamed up with Zaha Hadid Architects for a pop-up salon that puts hair styling front and centre. Launched during London Fashion Week and London Design Week, the Fudge Pop-up Salon fills the lower level of the Zaha Hadid Design Gallery at 101 Groswell Road in Clerkenwell. 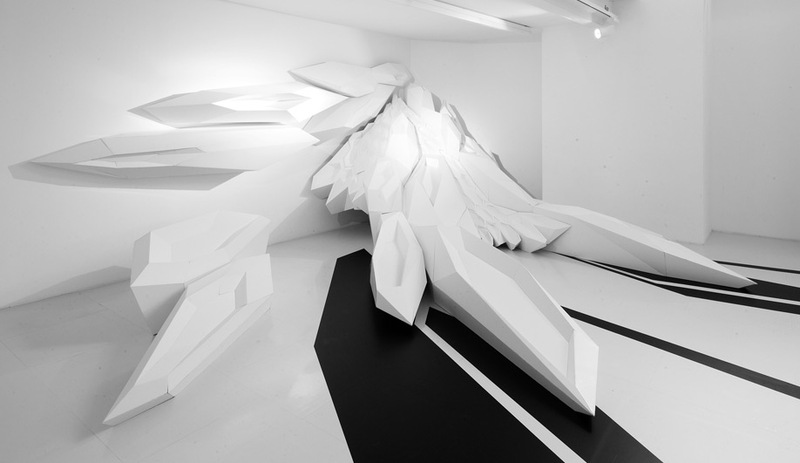 The salon’s monochromatic interior is defined by ZHA’s characteristic iceberg-like forms that jut out dramatically from one corner and hover just above the floor. 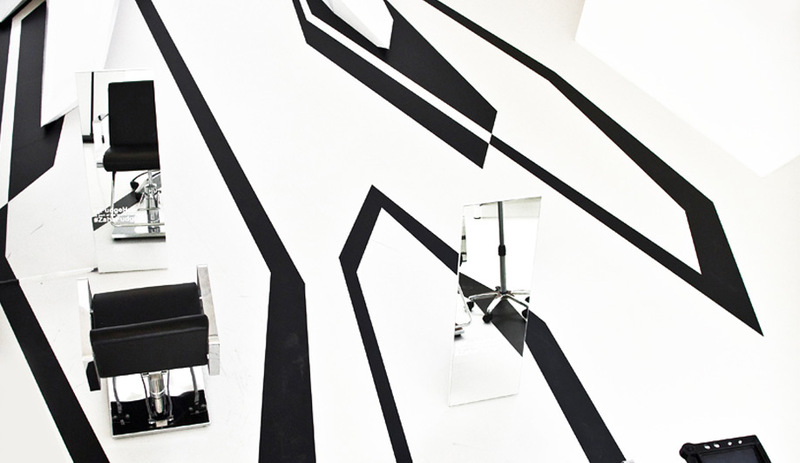 Linear black graphics run along the floor and walls and two black salon chairs are stationed in the centre of the space. This is definitely not a salon for the shy. 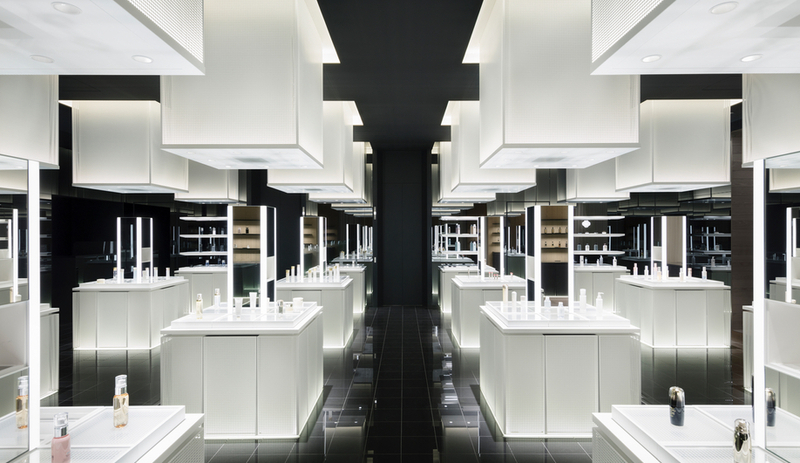 In this gallery-style setting, clients and stylists are all part of the performance when visitors wander in. According to ZHA, working on a small-scale project offers a much more immediate and spontaneous kind of interaction. “There exists much more fluidity now between art, fashion and architecture – more cross pollination in the disciplines which can be built upon in collaborations,” adds Zaha Hadid. 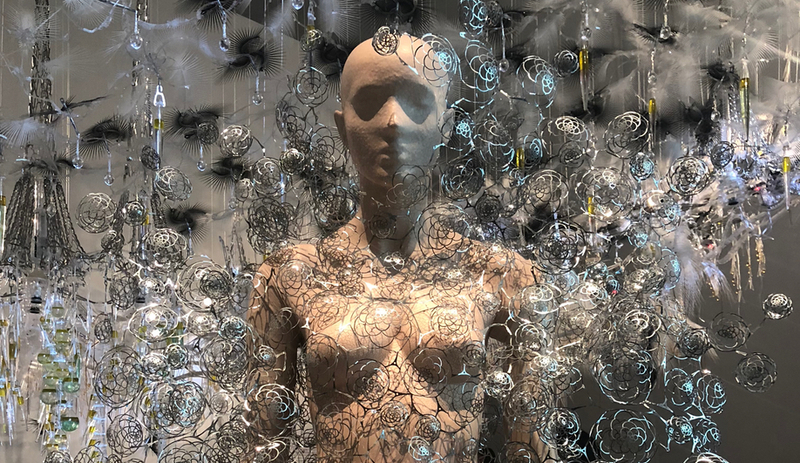 Due to massive popularity the salon has extended its run and is staying open another week to coincide with another big culture fest, the Frieze Art Fair, which runs October 11 to 14. Some of the projects the Pritzker Prize-winning Hadid is now working on include The Jockey Club Innovation Tower in Hong Kong and the future home of the Hong Kong Polytechnic University’s Design Institute for Social Innovation. Also, construction has begun on Port House, the new headquarters for the Antwerp Port Authority. Fudge Pop-up Salon is open until October 13 and is located at the Zaha Hadid Design Gallery, 101 Groswell Rd., London, U.K.